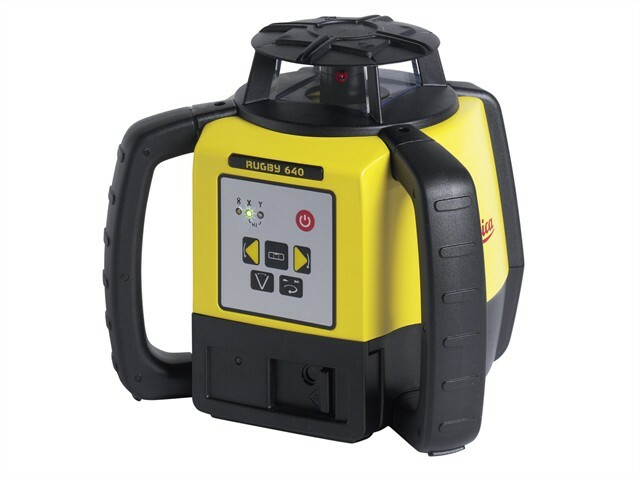 The Leica Rugby Lasers are the toughest rotating lasers suitable for all construction applications. Level more accurately and quicker than ever before, eliminating costly errors and downtime. Scan 90 – make layout easier by quickly moving the beam to the left or right side. Beam Down – automatic and accurate plumb down, for alignment over a reference point. Sleep Mode – Save battery and put the Leica Rugby into sleep mode without disturbing your set up. The unique Smart Slope function continuously monitors time and temperature changes to ensure accurate performance over the course of the day. Incredibly accurate, the deviation from level should be no more than ± 1.5mm over a 30m distance. Supplied with a Rod Eye Basic laser receiver which extends the laser’s use beyond the visible range and up-to 500m diameter. Powered by a long-lasting Lithium-Ion rechargeable battery pack which is extremely robust and allows more than 40 hours of operation per charge. A600 Li-ion Battery Pack and A100 Li-ion Charger supplied. All Leica Rugby products are covered by their PROTECT warranty service which provides lifetime manufacturer’s Warranty against defects as a result in manufacturing. Rotation speeds – 0, 120, 300 and 600/min.